The ATUC-50 Digital Wired Discussion System The What: Audio-Technica is now shipping the ATUC-50 Digital Wired Discussion System. Components include the ATUC-50CU Control Unit, ATUC-50DU Discussion Units, and the ATUC-M43H and ATUC-M58H Gooseneck Microphones. The What Else: The ATUC-50 system is designed for intuitive operation and plug-and-play functionality. 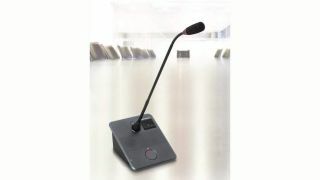 The system provides 24bit/48kHz uncompressed digital audio for clear and intelligible communication designed to significantly increase meeting efficiency and effectiveness. While available at a cost-effective price point, the system offers high power and flexibility, including multi-mode operation, 12-band feedback suppressor, ability to record a meeting directly to a mass storage device on the front of the control unit, and interpretation channels. A choice of two gooseneck lengths is available: the ATUC-M43H 17-inch (430mm) and ATUC-M58H 23-inch (580mm) microphones, allowing for added flexibility in terms of positioning. Employing standard Cat-5 (and above) cables, a complete system can support up to three ATUC-50CU control units and 150 ATUC-50DU discussion units can be connected in either daisy chain or ring topology (for added redundancy) and controlled from any web browser with no need for additional software installation. Configuration via Web Remote Control is simple and quick, with settings able to be stored as presets for easy recall. The Bottom Line: The user-friendly design of the ATUC-50 and its extensive feature set make it well suited for applications throughout the corporate sector, including boardrooms and meeting rooms, as well as government facilities, multilingual conference needs, hospitality, courts and judicial facilities, education, rental, and more.